Bear Grylls does not need introduction specially for people who love outdoor adventure. He teaches survival skills on TV show Man vs Wild on Discovery Channel. Here is ‘Bear Grylls’ 15 piece survival kit that should comes handy while in hostile outdoor environment. 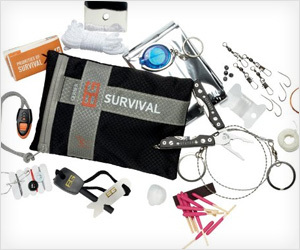 Kit includes: Survival blanket, fire starter, snare wire, fishing, sewing kits, Gerber miniature multi-tool for a range of applications and land to air rescue SOS instructions. Bear Grylls’ Priorities of Survival pocket guide is also included in the package. If you are ‘Bear Grylls’ fan, this kit for sure be stamp on this fact. As such, it is a decent survival kit package.